Optimization is an important issue in many areas. 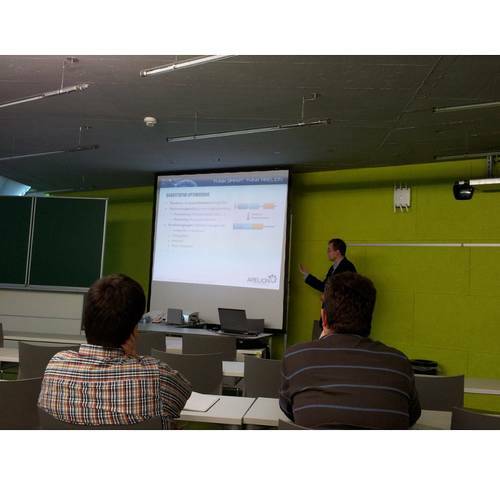 In the realm of the LCM forum “ICT in Mechatronics”, Dr. Thomas Scheidl of the IT start-up Arelion presented the basic technology of the software developed and marketed by Arelion for solving optimization problems. The goal of every optimization in industry is direct or indirect improvement of the business management parameters or of decision support. Optimization tasks occur in production planning, in logistics, in warehouse and in work scheduling. In ten years of research work at JKU, Arelion developed an evolutionary optimization method that, contrary to established algorithms, can solve highly complex tasks with excellent quality and low implementation effort. This optimization method can also be used ideally in dynamic environments. On four days this autumn, the LCM forum “ICT in Mechatronics” affords the opportunity to discuss various aspects and future trends via presentations by experts from science and industry (e.g., Industry 4.0).